ry: We have heard for years the cold fact that a group of twelve artists co-operatively founded the Inc in 1975. That doesn’t really tell us very much. Perhaps you could tell us who they were and how and why they got together. RY: I could name maybe six or seven people I think were founders of the Inc, but I don’t know for sure whether they were “official founders” or not. I am not familiar with what seems to have become “the official history”. The Inc is now grown-up, on its own, in need of no parents. I was there when wild-oats were being sowed but I was pretty hard to find as soon as the responsibility of an entity which needed lots of attention and guidance came crying and kicking into the world. There were requests for alimony, but I had my own off-spring and art to tend to. ry: Please, Mr Yates . . .
RY: Okay. But there is a difference between the founding of the Inc and the Inc itself. They have as much similarity as making love and raising kids. ry: Really, Mr Yates . . . Now, I understand you were a founder; so was Bryce Kanbara. . .
RY: I don’t know for sure whether Bryce was an “official founder” or not, but it has become my understanding that I was not. ry: Oh? Many people I’ve talked to are under the impression that you were a founding member of the Inc, and in some of your published writings you make that claim yourself. What’s the story? RY: I have been actively involved in the Inc very little of the twenty years it has been going. My involvement ebbs and flows between long stretches of complete abstinence and short periods of intense commitment. I don’t like the official meetings, proper procedures, committees, policies, organization and rules the Inc seems to thrive on. My lack of leadership is exceeded only by my inability to follow. I can’t really be closely associated with this or any other organization. ry: You are not a founder of the Inc . . . ? 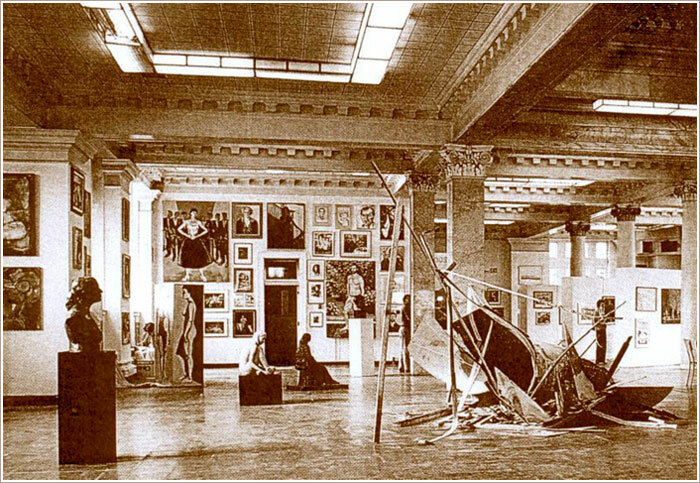 The Inc’s big “HAMILTON NOW” show of contemporary Hamilton area artists at the old Carnegie Library, 1986. The phenomenally successful 1986 NOW show was organized through the Inc and open to all Hamilton area artists. RY: I’m sorry. You may be interviewing the wrong person. I’ll tell you a story anyway. It should make it clear that you probably are interviewing the wrong person. 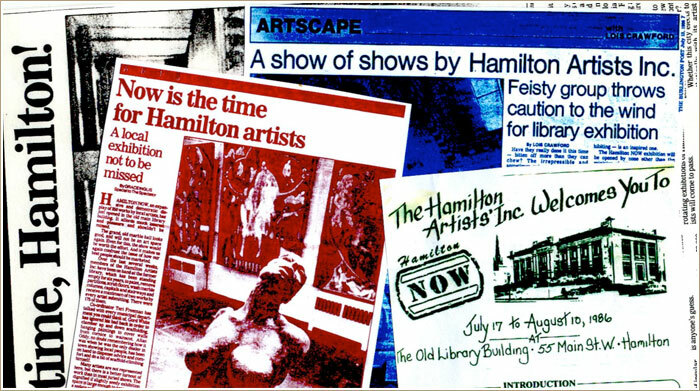 At the time of the big NOW show of contemporary Hamilton artists at the old Carnegie library building near City Hall — it was 1986, over ten years after the founding of the Inc — there was a simultaneous retrospective show of historic Hamilton artists across the street at the Art Gallery of Hamilton. This was a big Inc-inspired event for art in Hamilton, a celebration of past and present, of both historic and contemporary visual art in this region. So, late one night Bryce Kanbara and I were up on ladders writing with chalk on the walls of the Art Gallery of Hamilton, doing the installation for that show. . .